Hung-Kuo received his B.S. degree in Computer Science and Information Engineering (CSIE) in 2003 from National Cheng-Kung University (NCKU), Taiwan. He continued to pursue a Ph.D degree in 2004 and completed the degree in 2010. During his Ph.D course, Hung-Kuo visited Hong Kong University Of Science And Technology (HKUST) in 2007 and Chinese University Of Hong Kong (CUHK) in 2009 under the guidance of Chiew-Lan Tai and Tien-Tsin Wong, respectively. Hung-Kuo also visited Indian Institute Of Technology (IIT) in 2008 and King Abdullah University Of Science And Technology (KAUST) in 2009 for two cooperative research projects both under the supervision of Niloy J. Mitra. 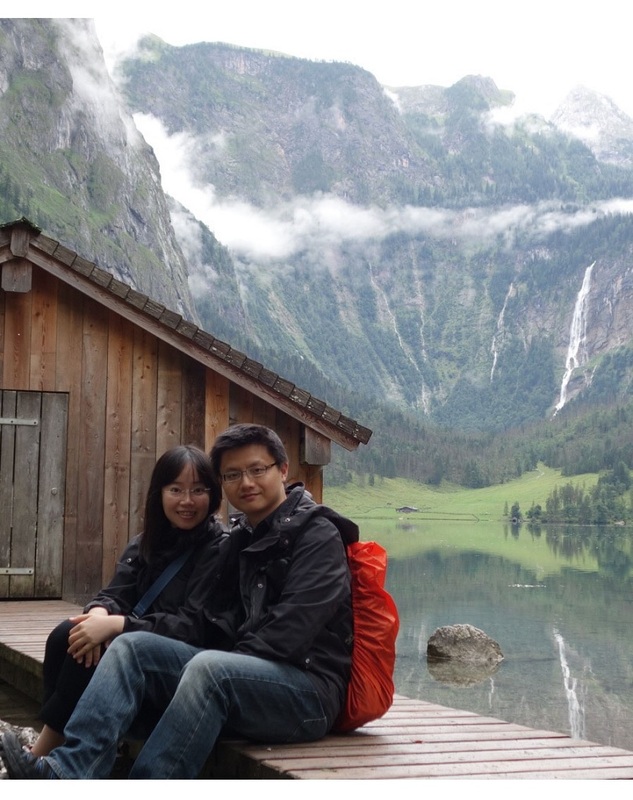 After the graduation, Hung-Kuo was recruited in a summer visiting internship of Yahoo! Inc. Research Lab under the supervision of Belle Tseng and Shyam Mittur. 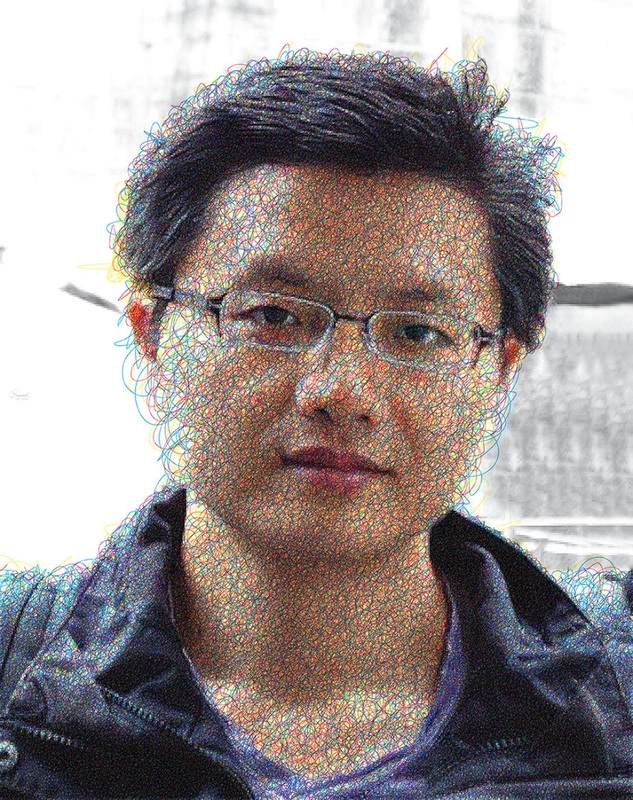 Hung-Kuo’s major research interest is Computer Graphics including specific topics like Shape Analysis, Smart Manipulation, Video\Image Processing, Human Computer Interaction and Visual Perception. "Tone- and Feature-Aware Circular Scribble Art" Received "Best Student Paper Award" at PG 2015. "PIXEL2BRICK: Constructing Brick Sculptures from Pixel Art" Received "Best Paper Award" at CGW 2015. This paper presents a novel algorithm to generate micrography QR codes, a novel machine-readable graphic generated by embedding a QR code within a micrography image. The unique structure of micrography makes it incompatible with existing methods used to combine QR codes with natural or halftone images. We exploited the high-frequency nature of micrography in the design of a novel deformation model that enables the skillful warping of individual letters and adjustment of font weights to enable the embedding of a QR code within a micrography. The entire process is supervised by a set of visual quality metrics tailored specifically for micrography, in conjunction with a novel QR code quality measure aimed at striking a balance between visual fidelity and decoding robustness. The proposed QR code quality measure is based on probabilistic models learned from decoding experiments using popular decoders with synthetic QR codes to capture the various forms of distortion that result from image embedding. Experiment results demonstrate the efficacy of the proposed method in generating micrography QR codes of high quality from a wide variety of inputs. The ability to embed QR codes with multiple scales makes it possible to produce a wide range of diverse designs. Experiments and user studies were conducted to evaluate the proposed method from a qualitative as well as quantitative perspective. Color scribbling is a unique form of illustration where artists use compact, overlapping, and monochromatic scribbles at microscopic scale to create astonishing colorful images at macroscopic scale. The creation process is skill-demanded and time-consuming, which typically involves drawing monochromatic scribbles layer-by-layer to depict true-color subjects using a limited color palette delicately. In this work, we present a novel computational framework for automatic generation of color scribble images from arbitrary raster images. The core contribution of our work lies in a novel color dithering model tailor-made for synthesizing a smooth color appearance using multiple layers of overlapped monochromatic strokes. Specifically, our system reconstructs the appearance of the input image by (i) generating layers of monochromatic scribbles based on a limited color palette derived from input image, and (ii) optimizing the drawing sequence among layers to minimize the visual color dissimilarity between dithered image and original image as well as the color banding artifacts. We demonstrate the effectiveness and robustness of our algorithm with various convincing results synthesized from a variety of input images with different stroke patterns. The experimental study further shows that our approach faithfully captures the scribble style and the color presentation at respectively microscopic and macroscopic scales, which is otherwise difficult for state-of-the-art methods. We present a deep learning framework, called DuLa-Net, to predict Manhattan-world 3D room layouts from a single RGB panorama. To achieve better prediction accuracy, our method leverages two projections of the panorama at once, namely the equirectangular panorama-view and the perspective ceiling-view, that each contains different clues about the room layouts. Our network architecture consists of two encoder-decoder branches for analyzing each of the two views. In addition, a novel feature fusion structure is proposed to connect the two branches, which are then jointly trained to predict the 2D floor plans and layout heights. To learn more complex room layouts, we introduce the Realtor360 dataset that contains panoramas of Manhattan-world room layouts with different numbers of corners. Experimental results show that our work outperforms recent state-of-the-art in prediction accuracy and performance, especially in the rooms with non-cuboid layouts. Interacting with digital contents in 3D is an essential component to various applications (e.g., modeling packages, gaming, virtual reality, etc.). A traditional interface such as keyboard-mouse or trackball usually demands non-trivial working space as well as a learning process. We present the design of EZ-Manipulator, a new 3D manipulation interface on smartphones that supports mobile, fast, and ambiguity-free interactions with 3D objects. Our system leverages the built-in multitouch input and gyroscope sensor of a smartphone to achieve 9DOF (nine Degrees of Freedom) axis-constrained manipulations and free-form rotation. Thus, using EZ-Manipulator to manipulate objects in 3D is easy. The user merely has to perform intuitive single- or two-finger gestures and rotating the device in hand(s) to achieve manipulations at respectively fine-grained and course level. We further investigate the ambiguous manipulations introduced by the indirect manipulations using multitouch interface and propose a dynamic virtual camera adjustment to effectively resolve the ambiguity. A preliminary study reports that our system has significant lower task completion times in comparison to the conventional keyboard-mouse interface, and receives positive user experience from both novices and experts. Flat design is a modern style of graphics design that minimizes the number of design attributes required to convey 3D shapes. This approach suits design contexts requiring simplicity and efficiency, such as mobile computing devices. This ‘less-is-more’ design inspiration has posed significant challenges in practice since it selects from a restricted range of design elements (e.g., color and resolution) to represent complex shapes. In this work, we investigate a means of computationally generating a specialized 2D flat representation - image formed by black-and-white patches - from 3D shapes. We present a novel framework that automatically abstracts 3D man-made shapes into 2D binary images at multiple scales. Based on a set of identified design principles related to the inference of geometry and structure, our framework jointly analyzes the input 3D shape and its counterpart 2D representation, followed by executing a carefully devised layout optimization algorithm. The robustness and effectiveness of our method are demonstrated by testing it on a wide variety of man-made shapes and comparing the results with baseline methods via a pilot user study. We further present two practical applications that are likely to benefit from our work. Wire art is the creation of three-dimensional sculptural art using wire strands. As the 2D projection of a 3D wire sculpture forms line drawing patterns, it is possible to craft multi-view wire sculpture art — a static sculpture with multiple (potentially very different) interpretations when perceived at different viewpoints. Artists can effectively leverage this characteristic and produce compelling artistic effects. However, the creation of such multiview wire sculpture is extremely time-consuming even by highly skilled artists. In this paper, we present a computational framework for automatic creation of multi-view 3D wire sculpture. Our system takes two or three user-specified line drawings and the associated viewpoints as inputs. We start with producing a sparse set of voxels via greedy selection approach such that their projections on the virtual cameras cover all the contour pixels of the input line drawings. The sparse set of voxels, however, do not necessarily form one single connected component. We introduce a constrained 3D pathfinding algorithm to link isolated groups of voxels into a connected component while maintaining the similarity between the projected voxels and the line drawings. Using the reconstructed visual hull, we extract a curve skeleton and produce a collection of smooth 3D curves by fitting cubic splines and optimizing the curve deformation to best approximate the provided line drawings. We demonstrate the effectiveness of our system for creating compelling multi-view wire sculptures in both simulation and 3D physical printouts. Mixed reality (MR) has changed the perspective we see and interact with our world. While the current-generation of MR head-mounted devices (HMDs) are capable of generating high quality visual contents, interaction in most MR applications typically relies on in-air hand gestures, gaze, or voice. These interfaces although are intuitive to learn, may easily lead to inaccurate operations due to fatigue or constrained by the environment. In this work, we present Dual-MR, a novel MR interaction system that i) synchronizes the MR viewpoints of HMD and handheld smartphone, and ii) enables precise, tactile, immersive and user-friendly object-level manipulations through the multi-touch input of smartphone. In addition, Dual-MR allows multiple users to join the same MR coordinate system to facilitate the collaborate in the same physical space, which further broadens its usability. A preliminary user study shows that our system easily overwhelms the conventional interface, which combines in-air hand gesture and gaze, in the completion time for a series of 3D object manipulation tasks in MR. While the content of virtual reality (VR) has grown explosively in recent years, the advance of designing user-friendly control interfaces in VR still remains a slow pace. The most commonly used device, such as gamepad or controller, has fixed shape and weight, and thus can not provide realistic haptic feedback when interacting with virtual objects in VR. In this work, we present a novel and lightweight tracking system in the context of manipulating handheld objects in VR. Specifically, our system can effortlessly synchronize the 3D pose of arbitrary handheld objects between the real world and VR in realtime performance. The tracking algorithm is simple, which delicately leverages the power of Leap Motion and IMU sensor to respectively track object’s location and orientation. We demonstrate the effectiveness of our system with three VR applications use pencil, ping-pong paddle, and smartphone as control interfaces to provide users more immersive VR experience. A large dataset of outdoor panoramas with ground truth labels of sun position (SP) can be a valuable training data for learning outdoor illumination. In general, the sun position (if exists) in an outdoor panorama corresponds to the pixel with highest luminance and contrast with respect to neighbor pixels. However, both image-based estimation and manual annotation can not obtain reliable SP due to complex interplay between sun light and sky appearance. Here, we present an efficient and reliable approach to estimate a SP from an outdoor panorama with accessible metadata. Specifically, we focus on the outdoor panoramas retrieved from Google Street View and leverages built-in metadata as well as a well-established Solar Position Algorithm to propose a set of candidate SPs. Next, a custom made luminance model is used to rank each candidate and a confidence metric is computed to effectively filter out trivial cases (e.g., cloudy day, sun is occluded). We extensively evaluated the efficacy of our approach by conducting an experimental study on a dataset with over 600 panoramas. We present PanoAnnotator, a semi-automatic system that facilitates the annotation of 2D indoor panoramas to obtain high-quality 3D room layouts. Observing that fully-automatic methods are often restricted to a subset of indoor panoramas and generate room layouts with mediocre quality, we instead propose a hybrid method to recover high-quality room layouts by leveraging both automatic estimations and user edits. Specifically, our system first employs state-of-the-art methods to automatically extract 2D/3D features from input panorama, based on which an initial Manhattan world layout is estimated. Then, the user can further edit the layout structure via a set of intuitive operations, while the system will automatically refine the geometry according to the extracted features. The experimental results show that our automatic initialization outperforms a selected fully-automatic state-of-the-art method in producing room layouts with higher accuracy. In addition, our complete system reduces annotation time when comparing with a fully-manual tool for achieving the same high quality results. Line drawing is a style of image abstraction where the perception of image is conveyed using distinct straight or curved lines. However, extracting semantically salient lines is not trivial and mastered only by skilled artists. While many parametric filters have successfully extracted accurate and coherent lines, their results are sensitive to parameters tuning and easily leading to either excessive or insufficient amount of lines. In this work, we present an interactive system to generate concise line abstraction of arbitrary images via a few user specified strokes. Specifically, the user simply has to provide a few intuitive strokes on the input images, including tracing roughly along the edges and scribbling on the region of interest, through a sketching interface. The system then automatically extracts lines that are long, coherent and share similar textural structures from a corresponding highly detailed line drawing image. We have tested our system with a wide variety of images. The experimental results show that our system outperforms state-of-the-art techniques in terms of quality and efficiency. Ambiguous figure-ground images, mostly represented as binary images, are fascinating as they present viewers a visual phenomena of perceiving multiple interpretations from a single image. In one possible interpretation, the white region is seen as a foreground figure while the black region is treated as shapeless background. Such perception can reverse instantly at any moment. In this paper, we investigate the theory behind this ambiguous perception and present an automatic algorithm to generate such images. We model the problem as a binary image composition using two object contours and approach it through a three-stage pipeline. The algorithm first performs a partial shape matching to find a good partial contour matching between objects. This matching is based on a content-aware shape matching metric, which captures features of ambiguous figure-ground images. Then we combine matched contours into a compound contour using an adaptive contour deformation, followed by computing an optimal cropping window and image binarization for the compound contour that maximize the completeness of object contours in the final composition. We have tested our system using a wide range of input objects and generated a large number of convincing examples with or without user guidance. The efficiency of our system and quality of results are verified through an extensive experimental study. Emergence is the visual phenomenon by which humans recognize the objects in a seemingly noisy image through aggregating information from meaningless pieces and perceiving a whole that is meaningful.Such an unique mental skill renders emergence an effective scheme to tell humans and machines apart.Images that are detectable by human but difficult for an automatic algorithm to recognize are also referred as emerging images.A recent state-of-the-art work proposes to synthesize images of 3D objects that are detectable by human but difficult for an automatic algorithm to recognize.Their results are further verified to be easy for humans to recognize while posing a hard time for automatic machines.However, using 3D objects as inputs prevents their system from being practical and scalable for generating an infinite number of high quality images.For instance, the image quality may degrade quickly as the viewing and lighting conditions changing in 3D domain, and the available resources of 3D models are usually limited.However, using 3D objects as inputs brings drawbacks.For instance, the quality of results is sensitive to the viewing and lighting conditions in the 3D domain.The available resources of 3D models are usually limited, and thus restricts the scalability.This paper presents a novel synthesis technique to automatically generate emerging images from regular photographs, which are commonly taken with decent setting and widely accessible online.We adapt the previous system to the 2D setting of input photographs and develop a set of image-based operations.Our algorithm is also designed to support the difficulty level control of resultant images through a limited set of parameters. We conducted several experiments to validate the efficacy and efficiency of our system. Pixel art is a modern digital art in which high resolution images are abstracted into low resolution pixelated outputs using concise outlines and reduced color palettes. Creating pixel art is a labor intensive and skill-demanding process due to the challenge of using limited pixels to represent complicated shapes. Not surprisingly, generating pixel art animation is even harder given the additional constraints imposed in the temporal domain. Although many powerful editors have been designed to facilitate the creation of still pixel art images, the extension to pixel art animation remains an unexplored direction. Existing systems typically request users to craft individual pixels frame by frame, which is a tedious and error-prone process. In this work, we present a novel animation framework tailored to pixel art images. Our system bases on conventional key-frame animation framework and state-of-the-art image warping techniques to generate an initial animation sequence. The system then jointly optimizes the prominent feature lines of individual frames respecting three metrics that capture the quality of the animation sequence in both spatial and temporal domains. We demonstrate our system by generating visually pleasing animations on a variety of pixel art images, which would otherwise be difficult by applying state-of-the-art techniques due to severe artifacts. A systematic approach to automatically synthesize scribble art with respect to an input image by a single continuous circular scribble. The results are similar to the artworks, which use circular scribbles to imitate the shape, features, and luminance differences created by skilled artists. LEGO, a popular brick-based toy construction system, provides an affordable and convenient way of fabricating geometric shapes. However, building arbitrary shapes using LEGO bricks with restrictive colors and sizes is not trivial. It requires careful design process to produce appealing, stable and constructable brick sculptures. In this work, we investigate the novel problem of constructing brick sculptures from pixel art images. In contrast to previous efforts that focus on 3D models, pixel art contains rich visual contents for generating engaging LEGO designs. On the other hand, the characteristics of pixel art and corresponding brick sculpture pose new challenges to the design process. We propose a novel computational framework to automatically construct brick sculptures from pixel arts. This is based on implementing a set of design guidelines concerning the visual quality as well as the structural stability of built sculptures. We demonstrate the effectiveness of our framework with various bricks sculptures (both real and virtual) generated from a variety of pixel art images. Experimental results show that our system is efficient and gains significant improvements over state-of-the-arts. Annotating RGBD images with high quality semantic annotations plays a crucial key to the advanced scene understanding and image manipulation. While the popularity of affordable RGBD sensors has eased the process to acquire RGBD images, annotating them, automatically or manually, is still a challenging task. State-of-the-art annotation tools focus only on 2D operations and provide at most image segmentation and object labels even with the presence of depth data. In this work, we present an interactive system to exploit both color and depth cues and facilitate annotating RGBD images with image and scene level segmentation, object labels and 3D geometry and structures. With our system, the users only have to provide few scribbles to identify object instances and specify the label and support relationships of objects, while the system performs those tedious tasks of segmenting image and estimating the 3D cuboids. We test the system on a subset of benchmark RGBD dataset and demonstrate that our system provides a convenient way to generate a baseline dataset with rich semantic annotations. An Origamic Architecture (OA), originally introduced by Masahiro Chatani in 1980, is a design of cuts and folds on a single piece of paper. Due to rigid paper crafting constraints, the OA design process is often time consuming and requires considerable skills. Several computer-aided design tools have been developed to provide a virtual design environment and assist the design process. However, the ultimate placement of cuts and folds still depends on the user, posing the design process troublesome and highly skill-demanding. Unlike previous work where OA designs approximate 3D models, we use 2D images as input and automatically generate OA designs from 2D shapes. QR code is a popular form of barcode pattern that is ubiquitously used to tag information to products or for linking advertisements. While, on one hand, it is essential to keep the patterns machine readable; on the other hand, even small changes to the patterns can easily render them unreadable. Hence, in absence of any computational support, such QR codes appear as random collections of black/white modules, and are often visually unpleasant. 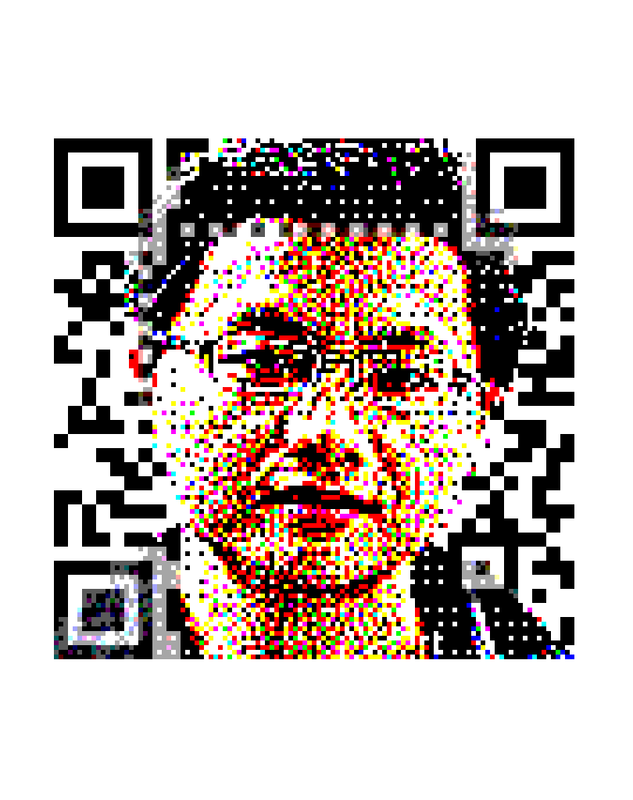 We propose an approach to produce high quality visual QR codes, which we call halftone QR codes, that are still machine-readable. First, we build a pattern readability function wherein we learn a probability distribution of what modules can be replaced by which other modules. Then, given a text tag, we express the input image in terms of the learned dictionary to encode the source text. We demonstrate that our approach produces high quality results on a range of inputs and under different distortion effects. In this work, we propose an automatic algorithm to synthesize emerging images from regular photographs. To generate images that are easy for human, rendered complex splats that capture silhouette and shading information of 3D objects.However, we realize that comparative information could be retrieved from photographs as well and replace the rendering of black complex splats with superpixels. They further take two post processing steps to make segmentation harder for bots, and both of them could find counterpart operations in image domain. Supporting by public image databases such as flickr and Picasa, we can envision a potential CAPTCHA application of our approach to massively and efficiently generate emerging images from photographs. Camouflage images contain one or more hidden figures that remain imperceptible or unnoticed for a while. In one possible explanation, the ability to delay the perception of the hidden figures is attributed to the theory that human perception works in two main phases: feature search and conjunction search. Effective camouflage images make feature based recognition difficult, and thus force the recognition process to employ conjunction search, which takes considerable effort and time. In this paper, we present a technique for creating camouflage images. To foil the feature search, we remove the original subtle texture details of the hidden figures and replace them by that of the surrounding apparent image. To leave an appropriate degree of clues for the conjunction search, we compute and assign new tones to regions in the embedded figures by performing an optimization between two conflicting terms, which we call immersion and standout, corresponding to hiding and leaving clues, respectively. We show a large number of camouflage images generated by our technique, with or without user guidance. We have tested the quality of the images in an extensive user study, showing a good control of the difficulty levels. Emergence refers to the unique human ability to aggregate informationfrom seemingly meaningless pieces, and to perceive a wholethat is meaningful. This special skill of humans can constitute aneffective scheme to tell humans and machines apart. This paperpresents a synthesis technique to generate images of 3D objects thatare detectable by humans, but difficult for an automatic algorithmto recognize. The technique allows generating an infinite numberof images with emerging figures. Our algorithm is designed so thatlocally the synthesized images divulge little useful information orcues to assist any segmentation or recognition procedure. Therefore,as we demonstrate, computer vision algorithms are incapableof effectively processing such images. However, when a human observeris presented with an emergence image, synthesized using anobject she is familiar with, the figure emerges when observed as awhole. We can control the difficulty level of perceiving the emergenceeffect through a limited set of parameters. A procedure thatsynthesizes emergence images can be an effective tool for exploringand understanding the factors affecting computer vision techniques. Extraction of curve-skeletons is a fundamental problem with many applications in computer graphics and visualization. In this paper, we present a simple and robust skeleton extraction method based on mesh contraction. The method works directly on the mesh domain, without pre-sampling the mesh model into a volumetric representation. The method first contracts the mesh geometry into a zero-volume skeletal shape by applying implicit Laplacian smoothing with global positional constraints. The contraction does not alter the mesh connectivity and retains the key features of the original mesh. The contracted mesh is then converted into a 1D curve-skeleton through a connectivity surgery process to remove all the collapsed faces while preserving the shape of the contracted mesh and the original topology. The centeredness of the skeleton is refined by exploiting the induced skeleton-mesh mapping. The contraction process generates valuable information about the object's geometry, in particular, the skeleton-vertex correspondence and the local thickness, which are useful for various applications. We demonstrate its effectiveness in mesh segmentation and skinning animation. Non-Photo-Realistic (NPR) rendering is an extended studied topic in computer graphics community. The main idea is to produce images of esthetic form with specific artistic style from either 2D or 3D media. Well known techniques include sketch simulation, water color painting simulation and illusory art reproduction. Among of them, the reproduction of illusory art has become an active research topic in a recent decade. In this course, students will be given an introduction of NPR history followed by studies of newly developed illusory art reproduction techniques. Students are asked to survey and study papers of top conference related to NPR rendering and give a presentation weekly. At the end of the course, each student requires implementing technique of one paper and presents the system in the class. This course is an extension to application programming. Specifically, it is focusing on graphics application programming. Before get into the detail algorithms and the operations behind the mystery of Computer Graphics, it is possible to write some basic graphics application programs. Similar to Windows programming that utilizes some Windows APIs to achieve the control of Windows applications, Graphics programming is using some Graphics APIs, such as OpenGL, to achieve the processing of graphics applications. By understanding the physical meanings and the control of each parameter in the Graphics API, without knowing the true implementation behind it, we can write some programs which utilizing the Graphics APIs and deriving some nice rendering results with proper assignment and control to the required parameters. In this course, OpenGL Graphics API will be introduced for the illustration of examples throughout the class. It is adopted due to OpenGL has been designed to be a cross-platform Graphics API running on PCs and mobile devices. Although OpenGL ES (OpenGL for Embedded System) is widely adopted as the standard Graphics API for mobile devices, it is actually consisting of well-defined subsets of desktop OpenGL. So, for students who learn OpenGL Graphics programming will benefit from writing Graphics applications in not only the PC platforms but also in many other mobile platforms as well. Game development is a hot topic in the modern entertainment industry. This course is divided into two major parts. In the 1st part, we present basic programming skills and resources required for beginners who want to experience game development. Specifically, we present the usage of OpenGL APIs, one of the most popular graphics programming languages. In the 2nd part, we give a training course of a well-known game engine, Unity3D which is capable of creating a fancy game quickly and intuitively.